At the Santa Cruz Museum of Natural History, we are fortunate to be able to provide local residents and visitors access to one the few existing historical Ohlone baskets. Many of the remaining historical Ohlone baskets are in museums as far away as Europe and even Russia. Here, so close to its origin, it can better be seen within its historical and cultural context. Based on the information received with the basket, we know that it was made by an Ohlone weaver at Mission Santa Cruz and purchased by James Frazier Lewis in 1885. We do not know to which of the local Ohlone tribelets this weaver belonged. Lewis, a Santa Cruz resident, was the son of Patty Reed Lewis, a survivor of the infamous Donner Party. This Ohlone basket was gifted by Robert Knapp, an heir to the Lewis estate, in 1945 to the Museum, where it has been on display or on loan at various points throughout its history. The basket itself is a gift or funeral basket, made from both traditional, local materials and non-native materials, using traditional techniques. It is coiled to the left, and utilizes willow and bracken root fern. 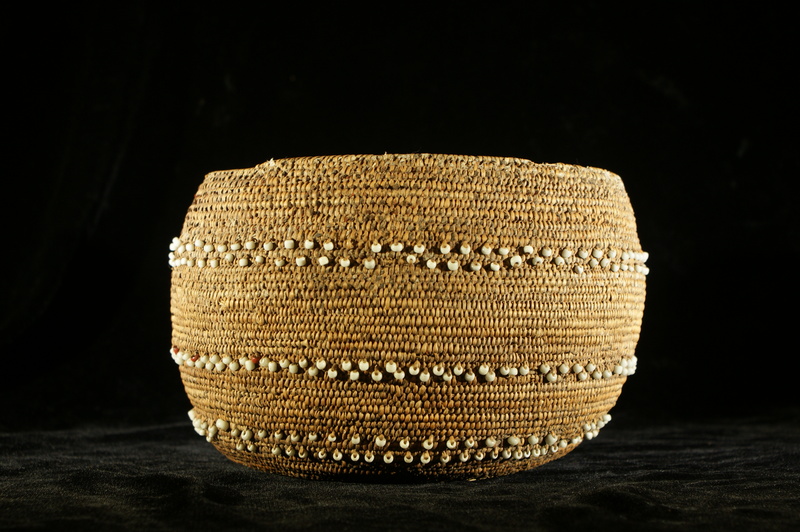 Like many baskets of the region, this basket has been adorned with beadwork. Traditionally the beads would be made from olivella shell disks. However, it was not uncommon to see European glass beads on these baskets, as is the case with this month’s Close-Up. These beads were typical of trade in the 1860s. These beads were sewn on with a single stitch of split willow. With the exception of a few red ones, the beads are white, which gives them a more traditional appearance. According to Christopher Moser in his Native American Basketry of Central California, this basket was originally decorated with Mallard Duck feathers and red Woodpecker scalps between the rim and first row of beadwork. Because of its history, the basket offers researchers an opportunity to better understand early California, including the ways that the Missions impacted traditional domestic practices and the made-for-sale basketry trade. It also provides us a chance to better understand the role of indigenous women and their work in native life, both prior, during and post-Mission era. And while many may think that basketry is a relic of the past, it is also still very much a living, vibrant practice carried out by today’s Native communities throughout the state and the country. This basket serves as a wonderful connection between the present and past, and is an invaluable reminder of the culture and history contained within it. Guest Author Maggie Hames is a SCMNH Collections Intern. She is digitizing our basketry collection and hopes to do her senior thesis research at the Museum.